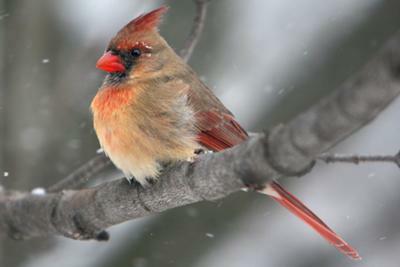 With the window open a crack just after New Year, I heard the tell-tale chirp of a Cardinal. There was a bit of a winter storm brewing as I looked out that window. I managed to capture this gorgeous female on a maple branch as the wind picked up a notch. There may have been a male in the nearby pines. A wonderful gift form God. Thank you for you sharing this great photo. Your picture is really good, I love the expression on the bird's face!